I connected with Dandy on Twitter and loved their enthusiasm. Dandy is a team that really cares about helping entrepreneurs; you know I love entrepreneurs, so featuring them was a no brainer. Lets get down to business! Nima: What initially sparked your interest in the mobile app arena? Matt: We started Dandy to solve a problem. As founders, we felt we had great app ideas, but had no way of knowing if the rest of the one billion smartphone users around the globe would love our ideas enough to download them. So we founded Dandy to empower anyone with an app idea to have a chance to receive feedback on their idea, to see if their idea is worthy of development and have potential to sell on the various app stores. Nima: Dandy is essentially assisting entrepreneurs from the idea phase all the way through validated learning and on to development and monetization. What a great service! Can you tell us why Dandy is a winner from an investor standpoint? Matt: We believe this model will allow us and our development partners to break through the noise of the 700,000+ apps on Google Play, Blackberry App World and the Apple App Store. From an investor’s standpoint, we believe we have a high potential idea, with a scaleable business model as well as the right team to execute successfully. Nima: There’s no doubt the mobile app marketplace is a crowded space. Good to know entrepreneurs now have a resource to validate their ideas. Matt: All three founders live in Waterloo Region and have been good friends for the last few years. They are all heavily involved in the local community, and came together to work on Dandy. 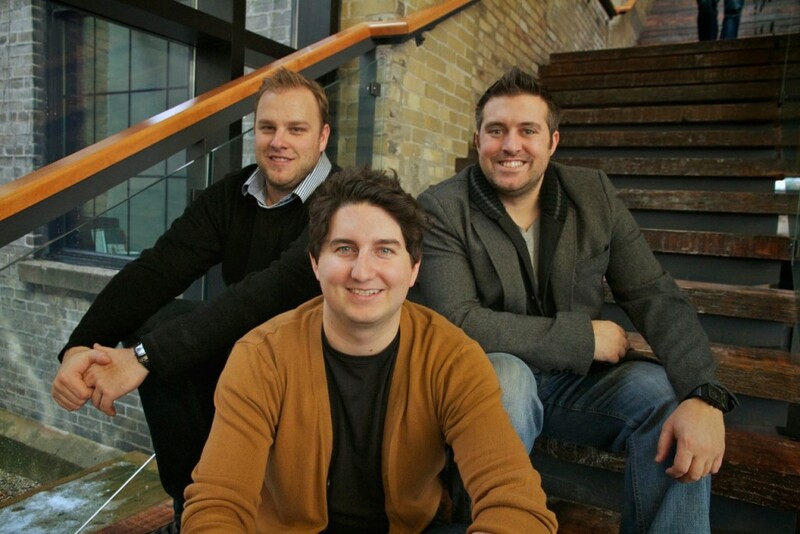 Our founders are Taylor Jones, Karl Allen-Muncey, and Matt Scobel. Nima: I made sure to follow the Dandy team on Twitter and I encourage our readers to do the same. I’m a firm believer that your network is your net-worth. Matt: Our idea was born in September 2012, when two of our co-founders were discussing how everyday people would go about getting their app ideas published to the app stores. We quickly brought our third co-founder Karl into the mix, and started to further develop our idea. Nima: When did you launch and how did you gain exposure? Matt: We launched our company on January 31st, 2012, the same day as we were announced as one of the 11 businesses accepted into the Communitech HyperDrive program. We’ve been growing our online community and introducing customers to the Dandy platform since then. We launched only a few weeks ago, but were able to find some early success. Dandy has leveraged our own social networks to launch the brand, teased our launch for one week, before we released our business concept and landing page. This helped us build buzz for our idea, and has led to a solid group of beta testers. We also reached out to as many media contacts as we could, and were successful in generating some early PR for our launch. Nima: Last Monday I interviewed the groupnotes.ca team and they shared their experience at the hyperdrive incubator. I need to fly out to visit Canada’s startup scene. You guys are rockin’ it! What’s one lesson you’ve learned along the way? Matt: The one lesson we learned through the process, is if you’re going to hype your project you better be ready to deliver. As we work on the Dandy platform, we are constantly working to ensure the user experience is on par with the hype. Nima: That’s sound advice. If you’re going to talk the talk you better be ready to walk the walk. What is your greatest asset? Does Dandy use lean startup principles? Matt: The greatest asset we bring to the table is our experience building communities. Taylor Jones has built a large, passionate online community in Dear Photograph with over 300,000 social connections between Twitter, Facebook and Tumblr. Karl Allen-Muncey, is a fantastic off-line community builder working with hundreds of organizations in the Waterloo Region and beyond. We are a passionate group that understands the famous quote from Steve Blank, “90% of startups that fail, fail due to lack of customers, not lack of technology.” We’ve built Dandy on Steve and other’s lean startup principles, looking to validate our business model at every turn, as we strive to create a passionate online community. Nima: I’m an avid reader and follower of Steve Blank’s advice. I used his website as a resource for my first business trip to Silicon Valley. In 4 days I visited 6 neighboring cities and attended 16 meetups. I got a VIP tour of Linkedin’s HQ, paid homage to the HP Garage, met with the Hacker Dojo and even got them a donation from Go Daddy. What a blast! Which domain registrar do you use for your domain portfolio? Matt: We used Go Daddy to register our domains, and then pass them on to Google Apps for email, contacts and calendar hosting. Nima: Love that you chose the .Co extension. What made you a .Co believer? Matt: We really struggled with choosing a domain. We registered a dozen or so, before we finally went with dndy.co. We wanted something short and sweet, but didn’t lack character. We originally launched the company as The Dandy Co, so the .co was a natural fit. Are you currently looking to recruit talent? If so, what positions? Matt: We are currently looking for talent with back-end web development experience, and iOS development. 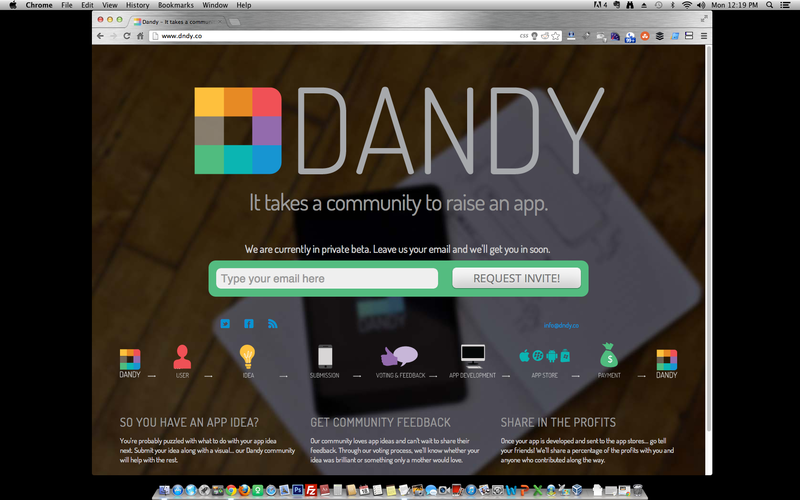 Please join me in thanking Dandy for the opportunity to learn about their startup story. I encourage our readers to sign up for a private beta invite and follow the Dandy team on Twitter. With their enthusiasm and commitment to building community I’m sure we’ll hear more about Dandy in the coming months! How is the IP protected in the community? Jackson, that’s a really good question. I forwarded it to the Dandy team. Dandy is an open forum for providing feedback on app ideas, and we can’t 100% guarantee that someone else won’t take your idea and develop it outside our community. However, we do take every step possible to ensure this doesn’t happen, and can assure you that if the idea is developed inside our community you’ll receive full credit (and your share of the revenue!). At Dandy we believe, the value isn’t inside the idea itself its inside the community that rally’s behind it. If a developer outside the community chooses to work against our system (developing on their own independently) instead of working with the community (partnering with Dandy and using our community for feedback, beta testing, and early pre-sales) we believe, they’ll end up on the losing end. If you have the resources and time to protect your idea, and develop it on your own we support that decision, and encourage you to pursue it. If you don’t, why not submit it to Dandy and let our community rally behind it. After all, what do you have to lose?